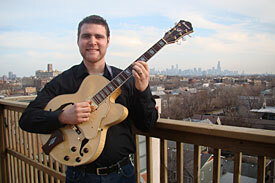 Jazz Guitar for Band Directors: How to Turn your Rocker into a Jazzer in Three Easy Steps! Clinic Synopsis: For many young guitar players, the school jazz band is often their first experience with jazz music, yet band directors often have little knowledge of jazz guitar pedagogy. This clinic will present simple strategies any director can use to help their guitarists move from "rocker" to "jazzer." Attendees will learn about selecting and setting up gear to get an optimal jazz guitar tone, comping with appropriate voicings in different styles, and developing guitar-specific improvisation skills. Clinician Biographical Information Mike Collins-Dowden teaches elementary and middle school band in Glenview, IL. During the summer, he is also on the faculty at the Birch Creek Music Performance Center in Egg Harbor, WI. He received his B.M. from the Eastman School of Music, and M.M. from Temple University. Also an active composer and arranger of music for young bands, he has published several pieces with Jalen Music.